There are over 50 farmers markets in San Diego county and each week we hear from people who are interested in selling at various markets. The Vista Farmers Market would like to create a single list of information and fees about each market in the county. Once prepared, it would then be available to anyone who requested it. 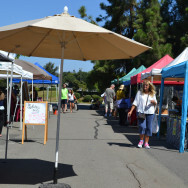 In addition, it would also help guide the Vista Farmers Market’s fee policies. We need someone to gather information about each market’s fees and related policies from websites, visits to the markets, conversations, and phone calls. Please contact Mark at mark@vistafarmersmarket.com if you would like to perform this useful research.